There are big opportunities in Europe in terms of building high potential tech companies. Although there has been a rapid catch-up during the past 10 years, the venture capital ecosystem in Europe is dispersed and fragmented. Much still needs to be done to come to a mature ecosystem. The good news is that many players are now aware of this European reality (often the solutions have been too much derived form the US which has been perceived as the role model) and there is a broader consensus about how to move forward. European Investment Fund (EIF) will play a significant role in shaping up tomorrow’s venture capital ecosystem to support small organisations to innovate. PROMIS@Service, Luxemburg: Mrs. Caterina Berbenni-Rehm, Chief Executive Officer. With special reference to increasing regulatory requirements: Why is it possible to make an active effort in corporate governance and the creation of space for all parties involved by means of future-oriented technologies? What possibilities are there providing simplified access to EU programs and activating the leverage on private investments taken into account the European Investment Fund? Speaking of „accumulated power“: What is the role of European innovation collaborations in terms of accelerating the research, development and the commercial launch of innovations? With special reference to SMEs: What are the main reasons leading to an obvious gap in quality and quantity of ICT application in the different regions and member states of the EU? 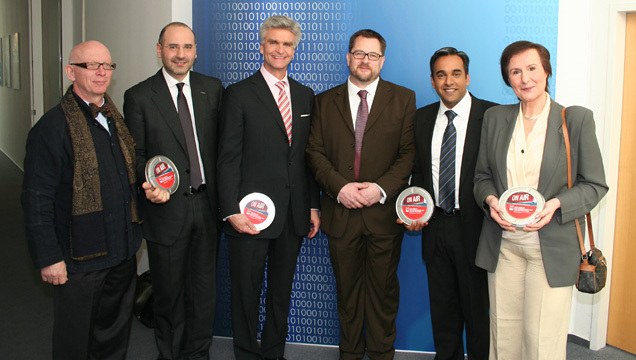 From left: Dieter Gruber, Andrea Benassi, Hubert Cottogni, Andreas Fischer, Nitan Pathak, Caterina Berbenni-Rehm.